The humble mop has been around since the 15th century. While many homes had floors made from packed dirt or plaster, and a simple broom was all that was required to keep it clean. It was the needs of the aristocracy to have a piece of equipment that could wet clean their slate, stone or marble floors, which were features of their homes, that gave birth to the mop. Little more than rags on a stick at the time, the mop has gone through varying design changes over the centuries. 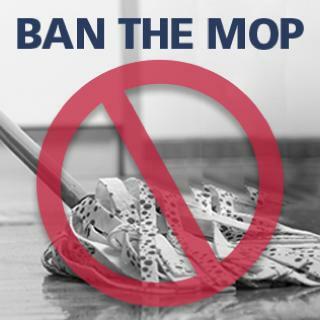 Over those years the mop has served the cleaning industry well, but technology has moved on, so join us in our call for a ban on the traditional mop for professional cleaning. Why has the mop reached its use-by date? The professional cleaning business has come a long way from John Farnham’s Sadie the Cleaning Lady released in 1967, where Farnham describes poor ‘old’ Sadie working her fingers to the bone. Mops have improved since their advent, but are still based around a simple cleaning system utilising a string, sponge or similar head unit that is dipped in a bucket of diluted cleaning solution, multiple times. This means it doesn’t stay fresh for very long becoming, contaminated with soils, germs and bacteria from the floor. This not only contaminates large areas of the floor with pathogens that may have only been present in one specific area, but it also leaves a dirty film on the floor. So, to really clean the floor properly with a mop and bucket there is a need for repeated passes and numerous rinses to achieve really clean floors. And as we know time is money, so it takes longer to clean the floor really well. Using a more advanced cleaning system to clean floors like the Nilfisk scrubber dryer has hygiene and productivity benefits. The machine scrubs and dries in one single pass giving fast access to cleaned areas, as well as a time saving benefit. As well as saving precious time, newer cleaning systems have ergonomic benefits. With a traditional mop and bucket there is a constant motion of pushing and pulling the mop and bending over to wring it out in a bucket. It is hard on the hands, arms and back for operators. Another drawback of the old-fashioned mop is wet floors. Even with a well wrung mop the newly cleaned floor will be wet which means the area needs to be closed for longer, and if accessed too soon can be very slippery. The modern scrubber dryer enables quicker drying times because it uses much less water than a traditional mop. Plus, it cleans more thoroughly having the power to remove grime, grease, and dirt that are traditionally very difficult to remove. In particular, a floor scrubber does its magic by spraying water and chemicals on the floor, scrubbing the dirt and grime away. Adding to the cost is the constant need to replace mops as they become contaminated. That cost adds up and although more sophisticated systems like Nilfisk’s scrubber dryers cost more upfront they can actually save money over time. Mops have been used to clean many different facilities in sectors like education, retail, healthcare, food industry and more. Pretty much any place a hard-indoor surface needs a wet clean, with each having their own challenge. With hygiene becoming a major focus for cleaning processes, no matter the size of your premises Nilfisk has a solution for you. You may have retail frontage where the layout may not be all that big. 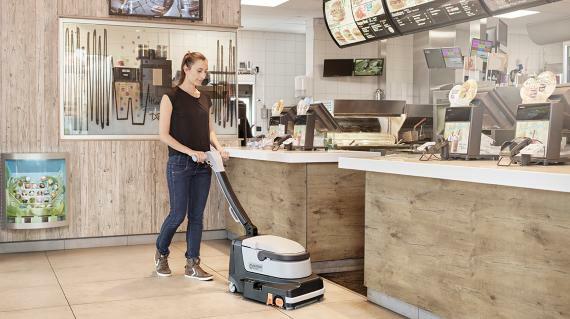 The Nilfisk SC100 Scrubber Dryer is the ideal solution for your business. Only weighing 12kgs, the SC100 is able to navigate narrow passageways and tight corners with ease, and cuts cleaning time dramatically with its scrubbing and drying technology. No more swaying back-and-forth, with a Nilfisk Scrubber Dryer one pass is all you need for a spotless and hygienic clean. In the hospitality and education sector hygiene is of the utmost importance, and a dirty old, discoloured mop containing unknown amounts of bacteria and grime is no longer an option. The Nilfisk SC250 is perfect for cleaning larger spaces with ease. With its sweeping, scrubbing and drying features that can be used in dual directions, no dirt or grime is safe. When more also needs to be faster and easier, you can’t go past the Nilfisk SC401. With a 43cm scrub deck equipped with a brush or pad that covers a greater surface area, and with a full-charge lasting up to 4 hours of continuous use, there is little the SC401 can’t accomplish fast and thoroughly. Combine this with the OneTouch™ button that activates all functions with a single click, and the simple 3 button dashboard, everything you need is literally at your fingertips. So, if you are after a more efficient, cost effective and thorough commercial cleaning solution, ditch the mop and grab a Nilfisk.